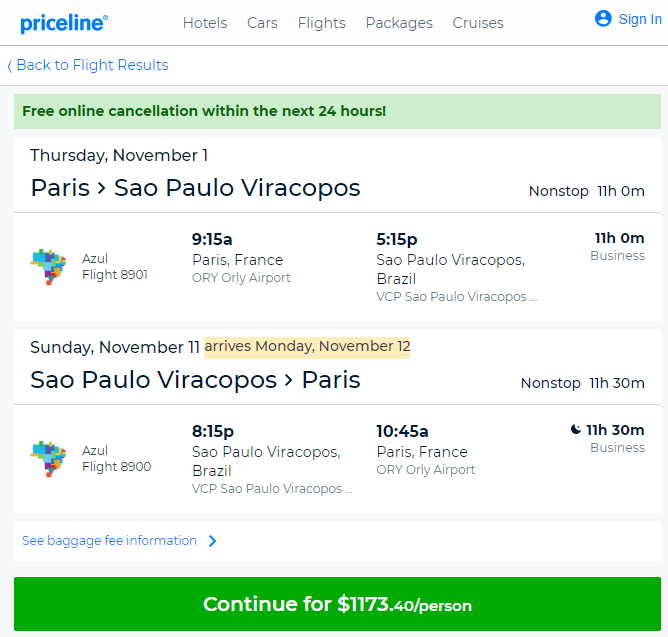 Today’s Airfare of the Day goes Azul Airlines and their business class promotional round trip fares between Paris and Brazil. 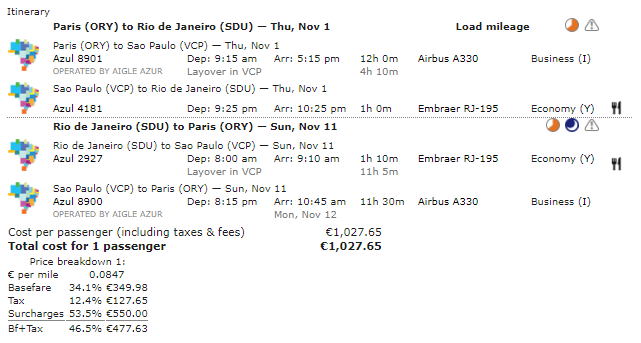 Fare: Azul (AD) IEEAJZ8E PAR to SAO/RIO. Price: from 1,015 € (350 € + taxes & surcharges). Flight restrictions: the fare component must include travel between brazil and area 2 on AD flights 8900 through 8903. Maximum stay requirements: travel from last sector must commence no later than 12 months after departure from fare origin. Stopovers: 2 stopovers permitted in each direction limited to 1 free and 1 at EUR 75.00. Transfers: 6 free transfers permitted on the pricing unit – 3 in each direction. Travel restrictions: from France – valid for travel commencing on/after 23AUG 18 and on/before 17NOV 18. To France – valid for travel commencing on/after 23OCT 18 and on/before 17NOV 18. Sales restrictions: tickets must be issued on AD or TP. Cancellations: charge EUR 550.00 for refund. Changes: charge EUR 400.00 for reissue/revalidation. Charge EUR 300.00 for no-show. The following accruals were estimated using wheretocredit calculator for ORY-VCP-SDU travel on AD marketed and operated flights without considering any elite status bonuses or ongoing promotions. Previous articleReader Question: “That’s nice, we are Marriott.” – Where To Go?